Fairly simple rules but offers a deep gaming experience with meaningful decisions. Tremendous replay value that will increase with planned future expansions from AEG. 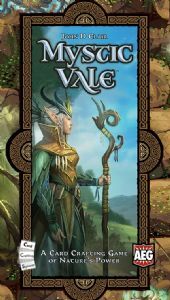 MYSTIC VALE A 2-4 Player Card Deck Building Game from AEG Players aged 14+ are more likely to enjoy and understand this game Designed by John D Clair (Downfall, KaPow!, Rumble Pie!) This is a deck building game fairly consistent with other games in this genre as far as game play goes but it does include some differences that make it more than a worthy adversary to those games for space in your game collection. Where it majorly differs is that apart from the 36 Vale (Reward) cards the player’s starting decks and subsequent Advancement cards are all printed on strong but flexible clear plastic. These plastic cards have all been sealed with a protective film which can be peeled off (start at one corner) in the same way as you would with phone and tablet screen protectors. However you do not have to sit there at the beginning of your first game and peel the seals off all of the 176 cards, just play with them as they are until the seal eventually starts to lift on its own, then you can carefully remove it without damaging the deck. Having the film on or off the cards makes no difference to the way the game is played, the cards are used, the way they shuffle or even the visual pleasures of the artwork; it is simply a protection for the production and has been left on because, as I say, it makes no difference and it does offer some additional protection, especially as you are more than likely to be playing MYSTIC VALE quite a lot. Apart from the cards there are a number of VP tokens in 1s and 5s plus one large round Mana Token for each player. A packet of 100 card sleeves, clear plastic and fairly strong, are supplied with the game. 80 0f these will be used immediately for the four 20 card player decks and the remaining 20 are spares, possibly because regular playing will split some of them and possibly because the author has it in mind to be producing new cards at some time in the future. Of course it could simply be that these card protectors/sleeves are packaged in units of 100 by their manufacturer and taking 20 out of each would be too much hassle. (If I could put a smiley-face emoji here I would but I can’t so you’ll just have to imagine I’m smiling when I say this). In or out of the sleeves the Advancement and Deck cards are quite likely to stick together for the first few games, until they become attuned, so for your own sake (as you really don’t want to ruin any of these delightful cards) take a little extra time to ensure that you haven’t picked up two or more (it’s usually just two that adhere together, any more than two make it too obvious there is a sticky situation), and also take extra care when shuffling these cards. Each player chooses a deck for their own. All decks contain the same number and type of cards but have different back designs and colours for ID purpose. They slip these cards into the protectors; generally making sure that they are all put in the same way up (so that you can read the text and the sleeve’s opening is at the top). This only needs doing at the beginning of the very first game, the Deck cards are never removed for any reason, but other cards, Advancements, will be put into the sleeves with the base cards during play and these do need to be removed. This produces one of the only mini-moans I have heard about the game which is that after the game ends you need to separate all the Advancements from the base cards and collect them up into their three separate specific decks, Levels, 1, 2 and 3; it’s a minor hassle but really no worse than sorting out counters etc. In the centre of the table the three decks of Advancements, Levels One, Two and Three are placed end to end in a face-down column with three from each forming a face up 9 card grid. The 18 Fertile Soil cards are also placed under this grid and for ease you can place one of each type of Fertile Soil card in a row, though this isn’t a necessity as the players can always choose which of the Fertile Soil cards they want to purchase; Top, Centre or Bottom as long as they are still available; they are limited in numbers to 6 of each type. Like most card games each card has some flavour text, in this case it’s minimal and basically just the Title. Other symbols are presented on one side of the card and may include Energy, Decay, a cost and possibly some action text. The cost of buying Advancement cards is paid in mana which you gain from the cards of your deck and the Vale cards have a cost in Spirit, the symbols of which are located on the Advancement cards. Some Deck cards as well as many Advancement cards also have a Decay symbol which is basically used as a way of saying you’ve gone over the limit – you’ve broken or in this case you have spoiled. Players remove cards one at a time from their deck and create a row in front of them, leaving one card on the top of the deck, known as the On Deck card. They can have numerous cards available to them in their row but only 3 decay symbols may be on show (including the OnDeck). Players use the energy symbols and the spirit symbols to buy cards from the table displays. Three of the energy symbols are specific in type whilst the fourth is a generic (or joker) capable of being used in place of any other spirit. If players push their draw and turn over a fourth Decay then they cannot buy any cards that turn but they do get a mini reward as they are allowed to flip their energy token over to its Active side, thus giving them an additional energy point for when they need it; this is flipped back over when used and back again if they spoil again and is proven to be a very useful and neat mechanic. Pushing the draw is essential but be aware that while you are doing this to bring the cards in your deck around quicker you are not adding any more Advancements to your cause. During their turn the players slip any Advancement cards (not Vale cards) they have bought into one of the Sleeve of the cards in their current row. Whatever symbol or text that is on the bought cards does not take immediate effect but will be available for use every time it is drawn thereafter. At the end of their turn all the cards in their row, except the OnDeck, are discarded and the OnDeck starts the next row, with cards again drawn one at a time. The Advancement and Deck cards are regular card size but have one piece of artwork, with/without text on them. This takes up one third of the card which may be the top third, middle third or (you guessed it) the bottom third. Advancements slipped in sleeves may never cover up another piece of art – there is just one exception and that is some of the cards have text that runs the length (rather than width) of the card and cards that also have this kind of text box may cover other similar cards, obviously then negating the power of the covered text, as long as the artwork doesn’t cover any previously occupied section of the card. So for example a card with lengthwise text and art in the top third may cover another card (or cards) with lengthwise text but only if their art is in the middle or bottom section. As you may have already realised you only have 20 cards in your deck, Vale cards are kept face up and can be utilised once per turn (tap them to show you have used their effect) and the majority (12) of these 20 cards can have up to 2 Advancement cards slipped into the sleeve along with it, the other 8 cards are blank and thus can have 3 Advancements each. This means you can whip through your deck pretty quickly by pushing and often accepting Spoiling to get to the card effects and symbols you want. Having limited space for Advancements also means you need to be a little careful and thoughtful of what Advancements you buy, but at the same time if you sit and wait to get the better Advancements the game can quickly pass you by. Many of the cards give VPs at the end of the game and others give VPs during the playing. There are a limited number of VPs available depending on the number of players and once they are gone the game ends (there are spares in case the amount required during the last turn is more than are left). The players count the VPs they hold as tokens and the VPs their cards give at the end of the game (these are shown on the cards in Silver shields) and the player with the most VPs is the winner. There is no building a Dungeoneering or Adventure group, no characters per se, no weapons or equipment that is attached or detached, it is all about your skill in deck building, your courage and knowledge in pushing, your abilities in the market-place, and to an extent, the luck of the draw. There is no player interaction, you do not compete with or fight opponents in any way, neither can you steal cards or VPs from them, thus it moves at a good speed with games being played and enjoyed in 30-45 minutes. I mentioned one mini-moan and here is another. Well actually it’s not really a moan it’s a bit of advice. Try not to play on a dark wooden surface, or a black glass or dark cloth covered table as it is quite difficult to read some of the numbers on the cards, particularly for the cost and especially if you have a large table or play area where players may strain to fully read the cards. I also mentioned that the Advancements are in Levels 1, 2 and 3. Read the rules thoroughly and you’ll see that each Level of card has a different colour and style of border art. So don’t be like us on our first game where we struggled to determine the card’s levels as the border scheme didn’t spring immediately to our attention. Being neither the sharpest tools in the box nor brightest stars in the sky, we scoured each card until we noticed the tiny dots, 1 dot, 2 dots or 3 dots, under the cost for the card in the top right corner; I will say that in our defence (apart from ore rules reader skimming the rules) that these dots are sometimes almost impossible to see. I am only saying this so you know to look straightaway for the borders, that makes it so much easier. The value and effect of the higher level cards is reflected in the higher price and the only way to get the necessary energy is to buy smart and push often. From start to finish MYSTIC VALE uses AEG’s Card Crafting System and is an exceptionally fine game. It is beautifully crafted, has excellent mechanics, scintillating graphics and artwork and plays easily and fast; the next player being able to start their turn whilst the previous player is still doing house-keeping from their turn. I am pretty sure that there will be expansions or maybe just extra card decks sometime in the not too distant future and I for one will be very happy to see them. If you like dominion you will like this. Build your deck by spending mana and spirits. Some cards give you special abilities some give you vp and spirits/mana. Spend wisely to buy cards. Push your luck for more spending power or if your unlucky your fields will decay. Clever card sleeve system changes each game you play.